www.johnseed.com: Artists Respond: Can a Nazi Painting Be Seen With Fresh Eyes? 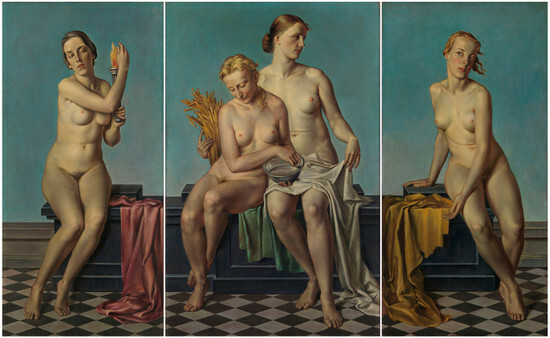 Earlier this week I came across The Four Elements by Adolf Ziegler on Twitter, and was struck by its odd blandness. I soon learned that it was once owned by Adolf Hitler and that the artist who created it -- called by some the Master of the Pubic Hair -- was a close associate of Hitler's who played a role in the persecution of Germany's Degenerate modern artists. The painting will be on view at New York's Neue Galerie this spring where it will provide a striking contrast to the assembled collection of Degenerate works. Can a painting so tainted by history ever be seen with fresh eyes again? The conversation took off quickly and over 250 comments later I am still thinking over what the many artists who responded had to say. The blog that follows gives just a few highlights from the conversation. The flavor of dialog has been lost as I have consolidated much of what was said, and re-ordered for clarity. That said, I have chosen what I think are some outstandingly interesting points. I have also linked the name of each artist who commented to their personal website so you can reference their comments to their art. A huge THANK YOU to everyone who had something to say, and especially to those of you who allowed me to include your comments in this blog. If we step back far enough, the answer has to be yes. The magnificent portrait busts of Roman emperors were used as propaganda for an autocratic regime, as well as for such particularly unsavory characters as Caligula, Nero and Caracalla. On the flip side of it, a handful of artists who worked for repressive regimes in the '30s should not be allowed to taint an entire movement, or for that matter, Classical art and architecture in general. As for the painting in question, I've seen it, and it's no great shakes. it was actually used as the centerpiece of a very tendentious show the Guggenheim held a few years ago, the entire point of which was to demonstrate the supposed Fascist orientation of all Classical art. Fascism probably does not have a very defined aesthetic. There were a variety of styles used, by artists with different backgrounds. The points of contact between Fascist art and non-fascist art during the same period are extremely plentiful. In a way, exhibitions like the one currently at the Neue Gallerie do nothing but perpetuate a rift, created by the Nazis, between orthodox and unorthodox, official and unofficial. All that's changed is the allegiance expected from us. I remember when I saw this painting in a show at the Guggenheim few years ago, it was part of the last section, the one devoted to the horrors of Nazi propaganda. I thought it was sincerely ridiculous to consider this painting propaganda: just because the girls are blonde? I think Craig is right: Nazi art is such when it regards Nazi subject matter. In the same period of time there were tons of figurative paintings made with the same kind of style by people which had completely different political orientations. I sincerely don't care if Hitler owned this painting. He owned Paintings by Boecklin and Rubens and Rembrandt: should we also consider those to be Nazi works? If you don't like the painting, the Nazi link makes it worse. If you do like it, and then hear it's a Nazi painting, it's uncomfortable. But it's an uncomfortable thing about art that it's difficult and maybe impossible to find a connection between quality (or taste) and morality. Over time, the political associations, no matter how awful, can be forgotten, like anti-Jewish references in earlier European Christian art. So, what if it turns out that Hitler didn't really own it? Or what if the painting somehow survives a nuclear war and the survivors find it in the ruins. Will people see it for what it is, then? Is there, in fact, a what it is? Does the painting on its own somehow embody or communicate Nazi doctrine? Even if it did, does the doctrine, if there is one in a painting, make it good or bad? By the way, Anne Harris, I'm not arguing that irony redeems this painting. Postmodern irony can't redeem anything, as far as I'm concerned. What I'm trying to provoke is a discussion about whether we are so brainwashed by the idea that "everything is political" that the accident that Hitler liked this painting automatically makes it evil, somehow. Frankly, I think it is a competent piece of painting, the artist knew how to model and foreshorten a form. 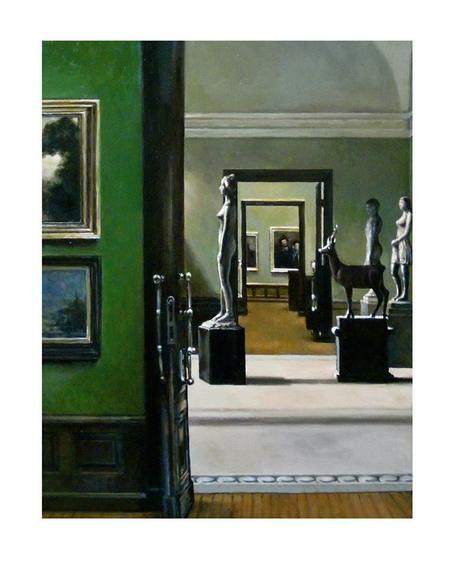 Compositionally it is certainly undynamic -- Fascism admires violent change and power but this painting communicates predictable balance, quiet and polite decorousness -- and no one would ever accuse the artist of being a colorist, for sure. What connects it to lots of current ideas about painting (and disconnects it from Modernist ideas about painting) is that it is not ABOUT painting. It is about the subject. Domenic Cretara, you ask an interesting question: is it possible to see a painting for what it is, rather than seeing it always in context. Actually, I would say no. We exist in context, so much so that we can never completely distinguish ourselves from our culture. A parallel: we can't hear our own accents. We will always bring our history, our experience, our knowledge and our ignorance to any work of art: we're not brainwashed, just human. A work of art exists in relationship to its audience and to its context. It's art because we think it's art. It has value because we give it value. There is no what it is without us, unless we ponder what it physically is: paint on canvas. That said, I don't think this painting is evil, I just don't think it's very good. Competence alone doesn't matter much, it simply indicates the artist was able to learn a predetermined skill set--no great achievement. The only reason we're discussing this piece is because Hitler owned it. The Ziegler painting could only seem benign figuration if you are utterly unfamiliar with Nazi mythology and its manifold manifestations. There is plenty of Holocaust and WWII literature around that will help anyone get their mind around why this painting fills the nostrils with the stench of Nazi violence. The interesting thing about evil is not its villainous or monstrous mien but that it all seems like a perfectly good idea. The Ziegler may or may not have been a commissioned work, it makes no difference, it is without doubt a Nazi catechism if it is anything at all; it embodies that ideology and one can nail that from a thumbnail a mile away or is supremely ignorant. It has no relation whatsoever to Classical Humanist values, not in the internal formational layer as it exists or the stylistic one. Humanity is impoverished for it's very existence. If there are those who sympathize with the aberrant figurative aspects of this work or paint like this, don't look up and don't look down... Still ambivalent? Kurt and Israel, I agree it is clearly a Nazi painting - but especially to Western, American-centric perspective, which saw most realist figurative art after Modernism as having possible ties to Fascist Neo-classicism (while ignoring our own politically-charged art). But a lot of good paintings also got lumped in with that unfairly. If a Chinese collector bought this they might find its allegory an exotic curiosity, mostly - and probably not feel any connection to, or sense of ownership of, its Nazi roots. OMG the woman painted on the right looks a lot like a John Currin Painting!!! If you swim in a polluted lake, you are polluted. in my view the work is the all important master... Andy Warhol put Chairman Mao in industrialists and bankers abodes. If the work is profound then it exists outside of it's relationship to being a commodity! That is why we have museums. A few years ago, I made a painting of an image that I sourced from a photo essay on Munich in 1937. I was attracted to the light and way the galleries receded, and the curious blend of fucked-up art contained therein. The caption labeled it part of 1937 Great German Art Exhibition at the House of German Art. Apropos to this, Ziegler would have debuted a suite of new works there, for certain. What struck me about it was that the sculpture and painting in the show wasn't historical, it was all Contemporary art by contemporary hacks (and a rigged deal to decorate new Nazified offices). Has Realism ever really recovered from this beating? The Nazis owned (stole) and liked an awful lot of paintings that are also masterpieces of Western Art. Mussolini and the Italian Fascists loved Modernism and Abstraction. Communism utilized Social Realism because it was effective at delivering it's message to the people. The CIA bankrolled Abstract Expressionism because it delivered the desired face of America to the rest of the world. Michelangelo and Raphael were in the employ of a perennially bloodthirsty and corrupt Catholic church. Successful artists always seem to be in bed with power, because that is where the money is. This mundane fellow, Ziegler, just got caught on a losing side, one that has become synonymous with evil. This status transfers to the work, and makes it far more interesting than it would otherwise be. And what about artists working today (including all of us on this thread)? Our works hang in the homes of the rich and powerful, and in the institutions they support. They got rich from the fruits of Western Capitalism, which dominates the world, and is responsible for horrendous ills on this planet. How should those people on the receiving end of our capitalist shitstorm view artists like Warhol or Basquiat, or more recently Hirst or Wool? How should they view us? I think we all have a little Ziegler in us, as much as we might like to think otherwise. Neue Galerie New York will open the exhibition "Degenerate Art: The Attack on Modern Art in Nazi Germany, 1937." This will be the first major U.S. museum exhibition devoted to the infamous display of modern art by the Nazis since the 1991 presentation at the Los Angeles County Museum of Art.